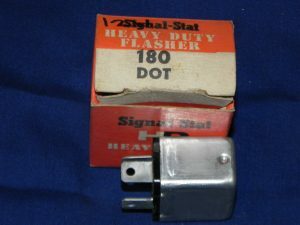 This 12 volt turn signal flasher 180 is new, NOS, Aluminum can with no lettering, a Signal-stat brand flasher, small rectangular in shape and in mint condition. It is a 3 terminal flasher with the terminals in the normal right angle configuration. 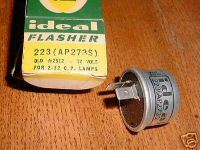 This #180 flasher was used on the following vehicles from the factory with a 3 bulb application and most likely others.